Let us finally put to rest one myth: Ted Williams was not frozen by his evil son, John Henry Williams. That is a bit of lore cooked up by the sports media that was marching behind Sport Illustrated‘s Tom Verducci back in the day with their pitchforks and torches. They did not like the idea of their baseball hero’s head stored frozen in a milk jug waiting for its guest appearance on Futurama. With the Larry Johnson kiss-and-tell book about Alcor Life Extension Labs coming out, the pot is being stirred again about Ted Williams frozen head, and its treatment. Forget that Mr. Johnson, as COO, ran the lab, and could have cleaned up the very things that he is now lamenting… for profit. Disregard that Tom Verducci, the sports writer who began ringing the fire bell about Williams’ handling of his father’s remains at Sports Illustrated (SI) did little more than source Bobby Jo Williams-Ferrell and those friends and family who didn’t like the idea. He also did very little follow-up when the court upheld that Williams indeed did co-author this request along with the children to whom he was still speaking. The oldest and estranged daughter, Bobby Jo had a history of emotional and financial issues with her father that had caused him to remove her from his will. She had a very big axe to grind with her half-brother John Henry, and half-sister Claudia, over the disputed will of Ted Williams. In the wake of the deluge of bad press, we found John Henry Williams playing baseball in Schaumburg, Illinois for the Flyers, an indy ballclub, for a few bucks a day. Why? If he was the greedy ghoul that he was being cast as, why was he not out there selling DNA, as some of the media wags were reporting? We were the only news agency to which John Henry would grant an interview, after the press hounded him about the head and the other rumors about the labs, because we asked why he was out there playing baseball. We didn’t ask him about Ted’s head. The answer was the key to the whole thing. We found out quickly that the picture that SI was painting of the whole situation was grossly distorted. In “The Kid’s Kid” we gave you the side of John Henry Williams that SI did not want you to see during Verducci’s march to turn the younger Williams into a blood-sucking leech, a pariah. He was a pretty simple man. Very naive about the media, and very single-minded about really getting to know the father who had largely never been part of his life until he hit thirty. John Henry Williams bonded with his father on the one level that counted for Ted: Baseball. Ted used his pull to get John Henry into the lower-levels of the Boston Red Sox organization. John Henry, even by his own admission, stunk. John Henry worked with his dad in the memorabilia business to help him out, particularly after Williams had hired a man to manage the business who had been forging signatures. John Henry gave structure to the memorabilia business, and limited his father’s appearances during his more frail periods, which actually improved the returns for Ted on the items that he personalized. Even after Ted died though, John Henry was out there working every day, hitting balls, taking instruction. Several weeks after that article, and my editorial “Is Sports Illustrated Out to Get John Henry Williams?” ran, Williams spoke to Mike Fish at SI, and affirmed what he had told us. Fish reported it as a sidebar though. His focus was a take-down of what a lousy ballplayer the scion was. John Henry, though, wasn’t trying to be a pro. He was trying to put himself, if only for a brief moment, into his father’s shoes. Baseball, for him, was communion with the Hallowed Father, not a career. In that light, Fish and the rest of the media wholly missed the story. John Henry loved his father, and honored him, even with Ted’s quirky behavior, and this pie-in-the-sky cryogenic pipe dream that the family cooked up. JHW also endured the slings and arrows that were thrown his way until he died himself, a little more than a year later. He knew what he was doing was right. That was good enough. He knew, as anyone who really knew the Splendid Splinter, that no one told Ted Williams what he could or couldn’t do, right up to the day that he died. The agreement that they made to have Ted “suspended” cyrogenically was upheld in court when Bobbie Jo tried to get a reversal. People get shot into space, and buried in their cars, and no one says boo. Ted Williams tries for his shot at immortality, and everyone is running around like Chicken Little. Dear Mr. Ross,I am John-Henry’s sister and I want to thank you for the eloquent and beautiful piece I just read on my brother [Elegy for a Lightweight]. You put other writers and journalists to shame with your insight and sensitivity to a human being. Thank you for taking the time to get to know my brother and talking to him. My brother put his dream on hold so he could be next to his father as long as he could and then waited a little bit longer so he could love him through his last days…. In the end, he still, despite discouragement from others, gave baseball a chance (or vice versa). He may have been closest to his father during the opportunity that the minor leagues gave him. I would like to close by saying how highly my brother spoke of the short time he spent within the minor leagues and all the young men struggling to follow a dream. Please thank them if you can … from me. 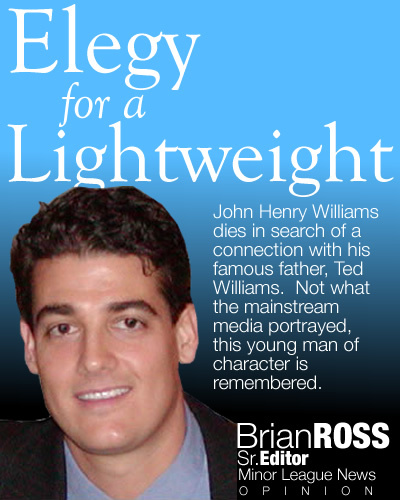 To Brian Ross:Your comments regarding John-Henry Williams are right on the money. I am the person who worked with J-H to try to help him hit at the professional level. J-H lived in my home for seven months trying to squeeze 7 months of hard work into 7 years of experience. We worked together for 6 hours per day, 5 days each week. His determination in trying to be a good professional baseball player was relentless. We had several personal discussions regarding everything going on in his life but he was driven (based on his true love of his father) to give it his best. The media tried to ruin him with sensationalism and untruths, I am pleased to see someone like you use reason to help people understand that he was not a villian. J-H was a real person, with real desire to succeed at an impossible dream. I respect him and will miss him. I want to thank you for the wonderful article about JH. I dated him when he was a student at UM. He was on my mind today, and wanting to see his face again, even if only on the internet, I came across your article. Thank you for showing the other side of JH. He was a sweet, caring person who loved his father deeply. This entry was posted on February 8, 2004 by Brian Ross in Baseball, Sports and tagged Alcor Life Extension Laboratories, Baseball, Claudia Williams, Frozen Head, Futurama, Hall of Famer, John Henry Williams, legend, Milb, Mlb, SI, Splendid Splinter, Sports Illustrated, Superstar, Ted Williams, The Kid, Tom Verducci.